The Warm Room: This is your first stop, where we offer talks and other presentations. It can comfortably accommodate 30 visitors. The “star wall” of the presentation room illustrates the full year’s night sky. It shows constellations, major stars, and selected deep-sky objects such as star clusters, nebulae, and galaxies. 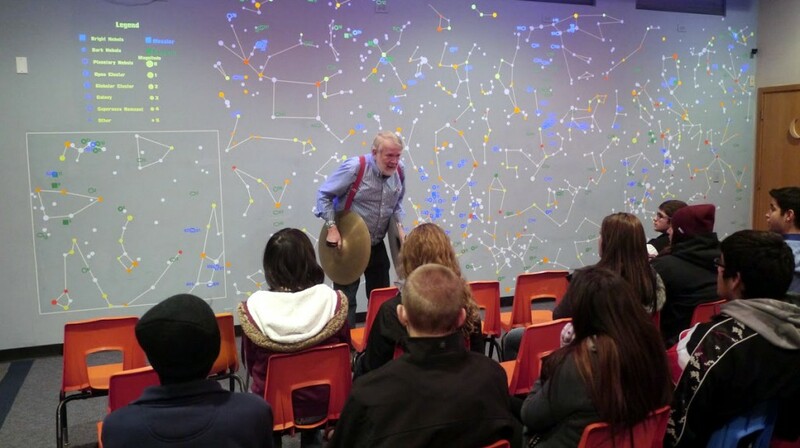 The star wall also depicts the sky from the cultural perspective of the First Nations, specifically the Lakota Sioux. We like to turn the main lights down so that the stars glow under the ultraviolet lights. This room also includes a digital projection system for showing films or computer slide-shows.